Billie B. Bond, 91, of Dawsonville passed away Friday December 14, 2018. 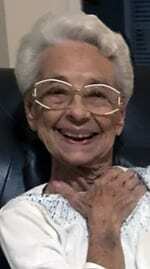 Born March 24, 1927 in Washington, Indiana to the late Arthur and Olive Davidson, she had lived in Dawsonville for the past year having moved from Lake Alfred, Florida. Mrs. Bond retired from State Farm following 29 years of service. A member of Lake Alfred Presbyterian Church, she was also preceded in death by her husband, Marion Bond; great grandson, Christian Pach; and a sister, Jane Hibbens. Surviving are her daughter and son in law, Cindy and Jack Jones, Dawsonville; three grandchildren and 13 great grandchildren. A visitation will be held Tuesday December 18, 2018 from 3 p.m. until 5 p.m. at Bearden Funeral Home.